NEW YORK—Treating the frail, long-overlooked structures with an unparalleled display of compassion, Pope Francis reportedly inspired a crowd of onlookers Friday by laying his hands upon the ailing United States infrastructure. 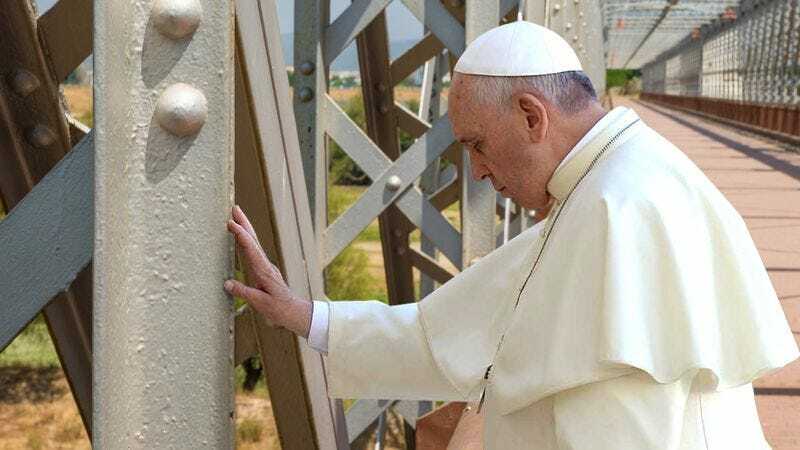 “My heart just melted when I watched the pope interrupt his address to walk over and gently embrace this disfigured bridge cross-girder that was covered in unsightly rust,” said New York City resident John Reedy, one of thousands of observers reportedly moved to tears as the pontiff reached out to the weak and crippled metal framework, gingerly kissed the decayed surface, and then closed his eyes while blessing the neglected overpass. “Most people turn the other way when they see such mangled, hopeless infrastructure, but he showed it such tenderness and attention, like he was really willing it to heal. Who knows—maybe God will intervene and save these decrepit structures.” At press time, the Vicar of Christ reportedly called upon the crowd to pray for the swift and painless passing of the terminally ill education system he had recently encountered.